Most manufacturers do not provide size charts, so we have created a few for you. (See links below.) Many of our garments have no manufacturer label or size tag because they were handmade. If the maker indicated a size, it is included in the item description; otherwise, we have estimated the size based on measurements. Please remember that sizing varies greatly from manufacturer to manufacturer and also frequently within a single manufacturer depending on style and season. For this reason, we have noted in the item description if the size seems to run especially large or small. We have included key measurements for each garment. All measurements are taken with the garment lying flat, front down. 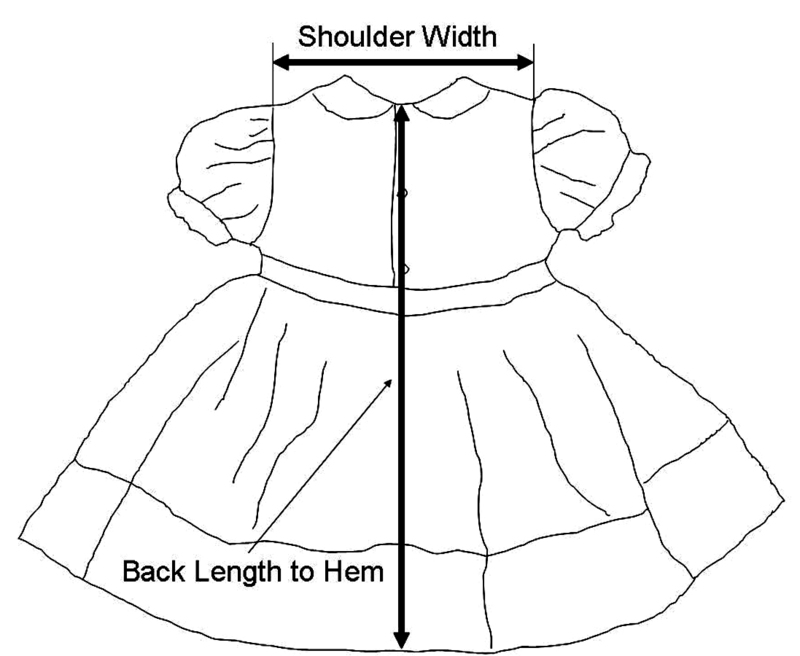 • For babies, toddlers, and little girls dresses, we measure the shoulder width from shoulder seam to shoulder seam and the back length from the back neckline (top of the fabric) at the center of the garment to the hem (bottom of the fabric). If there is a ruffle or lace trim, we include it in the measurement. If chest circumference is provided, it is measured around the chest directly under the arms. Please allow at least an inch greater than your child's actual chest measurement for comfort of movement. If waist circumference is provided, it is measured at the waist seam of the dress, which may or may not be at your child's natural waist. Please allow at least an inch larger than your child's waist measurement for comfort of movement. 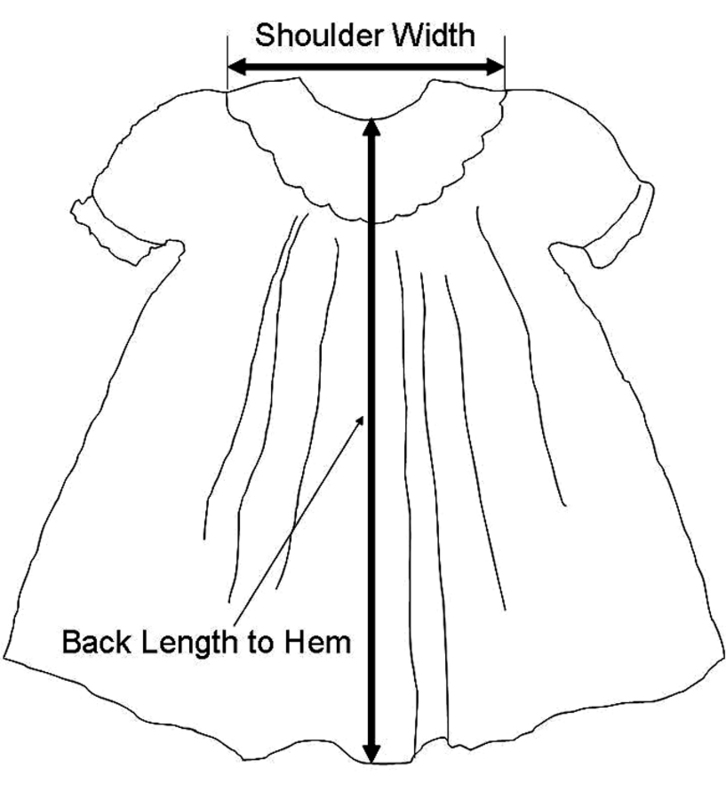 • For bishop style dresses, we measure shoulder width from the outside edges of the yoke or smocking because there are no true shoulder seams and the back length from the back neckline (top of the fabric) at the center of the garment to the hem (bottom of the fabric). If there is a ruffle or lace trim, we include it in the measurement. 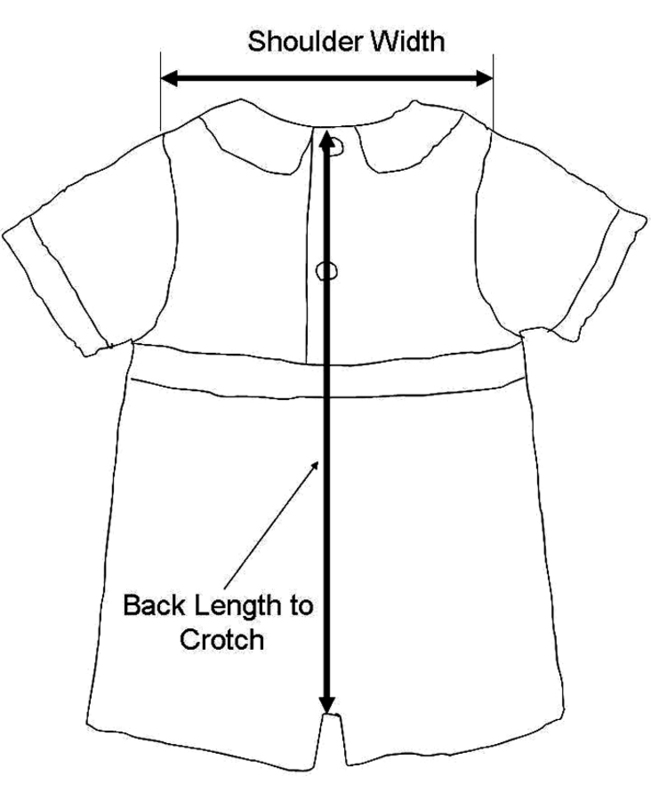 • For baby and toddler boys' rompers and button on shorts sets we measure the shoulder width from shoulder seam to shoulder seam and the back length to crotch from the back neckline (top of the fabric) at the center of the garment to the crotch (bottom of the fabric). To determine whether a particular garment will fit your child, it is best to go by measurements rather than size whenever possible. To ensure the best fit, DO NOT MEASURE YOUR CHILD. Measure a garment that fits your child well, preferably one that is woven rather than knit so that it does not stretch. Compare it to the measurements that we have provided for you in each product description. If you have questions about the best size to order or need additional measurements, please contact us or call us toll-free at 877-760-5259. • Vintage/Heirloom—garments from times past, generally dating from the 1880s through the 1960s, sometimes unworn, more often worn but still quite wearable. Although we purchase high quality vintage and heirloom garments in excellent condition, upon close inspection, you may notice small flaws that you would not expect in a new garment, particularly areas of thinning fabric, tiny pinholes, occasional broken seams, or small spots or color variations. All the items we sell have been meticulously pre-spotted, washed in Dreft, and carefully pressed and they are ready for your little one to wear. We make necessary repairs by hand to preserve the garment�s integrity and the occasional button, ribbon, or trim replacement is done with an item of the same period. Please do not expect an heirloom garment to be in the same condition as something you might purchase today in a department store. While the heirloom and vintage garments may appear more fragile or delicate than you are accustomed to, they were masterfully created 50 to 100 years ago with special skills that are today a dying art and they have withstood the test of time. Nearly all can be hand or machine washed using a gentle cycle and hung to dry. You�ll want to preserve many of these one of a kind garments for future generations! Please be aware, however, that most vintage garments would not meet today's flammability standards for sleepwear. Please be extra cautious to ensure your little one's safety. For many of the vintage items we sell, it is impossible to know with any certainty precisely when a garment was made; however, we provide our best estimate of a time period based upon when the item was worn, when similar garments were being created, the features and styles prevalent during particular eras of infant's and children's fashions, and the history of the garments as detailed when we purchased them. We consult an extensive library of vintage clothing catalogs, magazine advertisements, and sewing patterns from the late 1800s through the 1900s, as well as authoritative reference publications to date the garments you find in Grammie's Attic. We do not use museum-based methods to date textiles, nor do we consult antiques experts to authenticate the age of each of our garments. To do so would add significantly to their cost. Therefore, we will not be held responsible for errors in dating garments. You may pay for your items by Visa or Mastercard through our secure checkout system or by Discover, American Express, or your Paypal account through Paypal's checkout system. If you use Visa or Mastercard, your credit card information is processed through Yahoo Stores' secure servers with address verification. It may be necessary for us to contact you for your CVC (card verification code) or other additional information if you want the item(s) shipped to an address that does not match your billing address. Grammie's Attic is a registered Paypal seller. Paypal is a free, simple, secure online payment service through which you can pay with your American Express card, Discover card, debit card, or a checking account. We have chosen to use Paypal as a payment method because so many online shoppers already have Paypal accounts and we are confident that your financial transaction will remain private and secure. There is no charge to you as a buyer to use Paypal. You may select Paypal's checkout from the Payment page of the shopping cart. You'll be taken directly to Paypal's secure site to process your payment and then returned to our shopping cart to complete your order. We may also need to contact you if your address is not found in the U. S. Postal Service database so we appreciate your carefully entered telephone number and email address. Otherwise we have no way to contact you with important information about your order. We hope you will set your spam blockers to receive our emails. We are unable to register with the security services used by every one of our customers so we rely on you to ensure that you are able to receive emails about the status of your order. SHIPPING OPTIONS: We ship via US Postal Service using your preference of Priority Mail or Express Mail. For expedited shipping, we also offer UPS Next Day Air and UPS Second Day Air. PRIORITY MAIL orders generally are shipped within three business days. We are located in South Carolina. Actual shipping time for Priority Mail is USUALLY two to three business days depending upon your distance from our location, but may be longer depending upon the volume of Postal Service deliveries at any particular time. EXPRESS MAIL orders are shipped within one business day. Actual shipping time for Express Mail is USUALLY one to two days depending on the zipcode in your area. If you need to know the Express Mail Postal Service commitment for your area, please call us toll-free at 877-760-5259 with your zipcode and we will be happy to check the Postal Service website for you. Please note that Express Mail is NOT guaranteed overnight service and that we offer NO GUARANTEES for the Postal Service delivery. We are not responsible for Postal Service shipping delays and we are unable to offer you refunds for your shipping costs if the Postal Service fails to deliver your package in time. UPS NEXT DAY orders are shipped the same day and ARE GUARANTEED to be delivered the following business day as long as your order is RECEIVED BY NOON EST. Saturday and Holiday delivery is not currently available from UPS. UPS SECOND DAY orders are shipped the same day and ARE GUARANTEED to be delivered within two business days as long as your order is RECEIVED BY NOON EST. Saturday delivery is not currently available. We are aware that many of our customers who order via our webstore are not home to receive packages during the day. We send Express Mail packages with "signature waiver requested" which means that your mail carrier may leave your package without your signature. However, we cannot be held responsible if your mail carrier chooses not to honor our request and instead leaves a notice to pick up your package at the local Post Office. Should you choose not to to pick up your package within a week, it will be returned to us. Your account will be credited for the cost of the item(s) you ordered less the standard restocking fees, but no refund of shipping fees will be credited. We also cannot be held responsible for packages that "disappear" after the Postal Service confirms delivery of your package. Sorry, but we are unable to offer refunds or replacements if your neighbor, your neighbors dog, or anyone else takes your package. $250 and up = FREE for orders shipped within the US! UPS RATES: UPS Next Day and Second Day delivery is available for the continental United States. We regret that next day delivery is not available to Alaska, Hawaii, US territories, APO, or FPO addresses. Please understand that shipping rates include not only the cost of Priority Mail, Express Mail, or UPS postage, but also delivery confirmation, insurance, the cost of labeling, printing, and packaging materials to ensure that your order will arrive undamaged, as well as labor involved in pulling your items from inventory and packing them. We know that it is difficult to order a garment online sight unseen and get the correct size. In addition to size, we offer measurements for nearly every garment we sell. (If an item has been newly listed the measurements may not yet be listed. You may email us or call us at 843-388-3158 or toll-free at 877-760-5259 to request the measurements.) Please try to ensure that you are ordering the correct size! We ask that you carefully measure a garment that fits your child well and compare the results to the measurements we list for each item. See Size Information for additional details. If you are in doubt about what size to order, please email us or call us at 843-388-3158 or toll-free at 877-760-5259 to request additional measurements. We're happy to measure garments for you. We don't want you to be disappointed because you have ordered the incorrect size! We recognize that occasionally, despite everyone's best efforts to order the right size, an item may not fit. Unless you have ordered a new item that we carry in multiple sizes, it is unlikely that we will be have the item you ordered in a different size, because many of the garments in the webstore are unique, one-of-a-kind purchases. You may return unworn items with all tags attached for store credit or a refund of your purchase cost (less restocking fee) within 30 days of purchase. Please do not let your child wear an item with the tags tucked inside, even if it's "just for photographs" and attempt to return the item for a refund. Your baby will be unhappy and so will you when we refuse to refund the cost of your purchase if the item has been worn. Trust us, deceptions are evident. We make a special effort to ship your items so they will arrive wrinkle-free and ready for your little one to wear. Please have the courtesy to return them in the same condition in the same box in which they were shipped. You will be credited for the price of the items less a $5 restocking fee per item. For christening gowns, first communion dresses, and special occasion items, the restocking fee is 10% of the cost of each item. The restocking fee will be doubled for any item returned stuffed into a bag type mailer rather than returned in its original packaging. No credit will be issued for items returned damaged, torn, soiled, stained, with buttons missing, or in otherwise unsellable condition. Please note that we are not responsible for manufacturer's defects, including loose or missing buttons, buttons not properly aligned, buttons or snaps that fall off, fabric flaws, or items that fade, colors that bleed, or fabrics or trims that fray when washed. As with most webstores, we are unable to offer you credit for shipping since those fees have already been expended. If you received free shipping, appropriate shipping costs will be deducted before your credit is applied. The restocking fee applies to exchanges as well as refunds. If you wish to exchange an item for a different size or style, please return the item for credit and place a new order for the desired item. This will expedite processing, ensure that the item you select will still be available, and the item will ship sooner than if we wait to receive your returned item. Returns for holiday items must be received by January 10 in order to be credited for the original cost of the item (less the restocking fee). Any holiday return received after January 10 will be credited at the current sale price less the restocking fee. If the item you return has been reduced in price since your purchase, you will be credited at the current selling price less the restocking fee. Refunds can only be issued within 30 days of the item purchase. For your protection, our secure servers do not maintain your credit card information for more than thirty days. Returns can not be accepted past thirty days from the date of purchase. If you are unhappy with your purchase in any way, please contact us immediately! We truly want you to be pleased with your purchase from Grammie's Attic. We will be happy to gift wrap your purchase and send directly to its recipient. There is an additional $5.00 charge per package. Our standard infant and toddler gift wrap is a sweet vintage blue bear with a pink bow on a white background. We also offer a gender neutral wrap with vintage yellow duck pull-toys that is an appropriate for either baby boys or baby girls for most occasions. Our birthday wrap is yellow with teddy bears holding red, yellow, and blue balloons. If you would prefer holiday wrap (Christmas, Hannukah, Valentine's Day, or Easter) or an alternative better suited to older children, please let us know in the gift wrap message box on the order page. You can also use this box to specify delivery instructions or any special message you'd like included. We'll enclose a little card hand written with your special message attached to the package. Are you searching for the perfect gift for a newborn baby? Looking for a unique baby shower gift -- one that will stand out in a sea of onesies and burp cloths? Trying to find the ideal Christmas present or birthday present for that special little one? Not sure about sizes or styles? Prefer to skip the hassle of post-holiday returns? Why not make it easy on yourself and choose the gift that's always welcome -- a Grammie's Attic Gift Certificate! You can have your Gift Certificate emailed or we'll send a printed Gift Certificate if you prefer. Then the fortunate recipient of your gift can shop at her leisure, selecting just the right baby items in just the right size. And you will be much appreciated as the giver of this thoughtful gift. Contact us if you have questions or would like to purchase a gift certificate in a denomination other than those shown below. CONTACTS: We want you to be happy with your purchase and to tell your friends about us! Please contact us with questions about your order. You can call us locally or internationally at 843-388-3158 or toll-free at 877-760-5259, email us, or write to us at Grammie's Attic, 476 Triple Oak Drive, Mount Pleasant, SC 29466. LOOKING FOR SOMETHING SPECIAL? If you have something particular in mind but don't see in in our webstore, please let us know. We have hundreds of beautiful garments in stock that are not yet on our site. If we don't have it yet, we may be able to find it for you. THANKS: We appreciate your order very much and we hope that you'll become a repeat customer! Your satisfaction is important to us. You will receive an email from Grammie's Attic requesting feedback shortly after your order arrives. Please take a moment to respond with comments or suggestions about the items ordered, the transaction, or the website. Yahoo may also ask you to complete a Yahoo stores ratings survey. Your participation in providing feedback is entirely voluntary but very much appreciated and your suggestions do make a difference. We've made many changes to the webstore based on your most helpful comments and recommendations. We appreciate your order very much and we hope that you�ll become a repeat customer!